This log rack is constructed of durable, 18-ga., 1 1/4" outside diameter tubular steel and features a baked-on, polyurethane powder-coated, glossy black finish. Holds 1/2 face cord of wood, is 46" high, 14" deep, and 87" long. 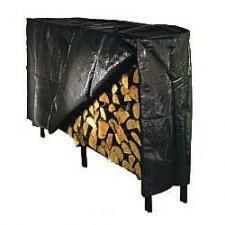 Protects your firewood from the weather and keeps it dry for easier, cleaner burning.